Phil and I have been away from the flat for a few days, and so the thought of tomatoes burning dry in the hot Hamburg sun has been preying on my thoughts. But, the weather gods were kind over the weekend providing enough rain to cover the 4 days of non watering, and evidently enough sun to produce a surprise when I returned home this evening. As you can see in the photo quite a few hit ripeness at the same time, on various plants. We now have quite a few gearing up to ripen so I think the next few weeks will bring a glut. They don't seem to have minded the rain or the wind too much although I've been trimming back the browning leaves on a regular basis. I thought this was probably tomato blight but Grandpa Jock's post makes me think it might be a bit of wind burn. Anyhow, with the plants focusing on fruit at the moment I'm not concerned about cutting back excessive leaf growth. It has been a truly satisfying experience taking these from a packet of sutton seeds in a dorset garden centre to a tomato glut in Hamburg. Happy times indeed. I also planted a few additional lettuce seeds on Friday, and they've already sprouted so we should have some fresh lettuce to accompany our tomato glut in later August. 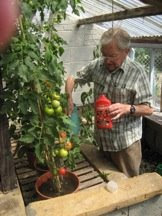 This is a guest post from Grandpa Jock (my Grandpa) who has been growing tomatoes at Deepwell in Somerset for as long as i can remember. Happy reading! Andrew. Before you even start to grow tomatoes, you have to understand that they need constant attention through watering, feeding and ‘pinching out’ if you want a good crop. The variety of plant you choose is dependant on how much space you have to grow them: the larger varieties need height (about 4 feet) to fully develop, though you can ‘pinch off’ the tops to restrict upward development. If you are tied to a ‘window-box’ or restricted area, bush varieties are probably best. If you have the time and patience, perhaps the best way to grow toms is from seed. At least, then, you have full control over how they develop. Buying ‘starter’ plants from a garden centre or B&Q type supplier can be very ‘hit and miss’ as many of their plants have been ‘forced’ and tend to run out of growing steam very quickly. Best way is to find a trusted supplier of young plants early in the season (early to late April) and then gradually bring them on. Toms need as much light as they can get, so try to place the plants in a position that gets the maximum amount of sunlight. It’s also important to keep them protected from the wind if you are growing them outside…. ‘windburn’ will quickly shrivel leaves and affect the health of the plant. 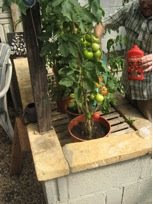 Tomatoes need lots of water…… typically, a good ‘soak’ every couple of days to keep the growing medium moist. You will be amazed at how quickly moisture is both taken up by the plant to grow the fruits and also lost through evaporation through the leaves. Don’t be afraid to saturate the pot….. next time you come to water, the soil will be almost dry (particularly during a hot spell). Whilst most growing mediums provide all the essential nutrients a tomato plant needs, a helping-hand in the shape of liquid fertiliser will go a long way to ensure that you get some well-developed fruits. I’ve tried many over the years, but tend to use ‘Tomorite’ which is a concentrated liquid fertiliser which I dilute in the watering can (don’t under-dilute!!) and apply every 2 weeks or so during the growth cycle. Depending on the variety of tomato plant you are growing, some of the bigger plants such as ‘Shirley’ (shown above) need constant manicuring to ensure that the plant’s ‘growing effort’ goes into producing large and succulent fruit, and not into additional shoots. You will see from the picture that I’m ‘pinching out’ a new growth shoot which, if unchecked, would develop into a new stem, which would divert growing effort away from the rest of the plant. ‘Pinching out’ is an art in itself, and where and when to do it only comes with experience!!. Pick fruits as they ripen…. By doing this, you ‘relieve’ the plant of having to divert moisture and growing effort to already ripened toms and allow the developing fruits to ripen. Towards the end of the season you will be left with a number of ‘green’ fruits which probably won’t ripen on the plant but may be of a reasonable size: harvest those before you consign the plant to the compost heap, as some will ripen in a drawer (with a banana for company……trust me, it works!! 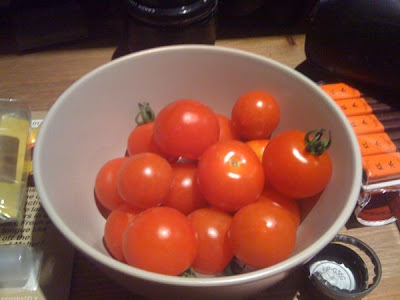 ), or use them for cooking or making chutney (Stuart’s Green Tomato Chutney recipe available at no cost!!). Sadly, this year hasn’t been good for tomato growing at ‘Deepwell’. Lack of constant sunlight slowed the development of the plants, and whilst we’ve still got 2 or 3 plants which will probably yield some decent fruit, we’ve had better. Good luck, and if you have any problems with your plants, let me know and I’ll do what I can to advise. We have arrived. In the space of a few hot days flashes of red have graced our balcony. It was only one at first, just visible on Sunday. But upon checking this morning I could spy no less than three fruits ripening with at least ten more showing serious intent. With forecasts of 26 today and 28 throughout the rest of the week I think by the end of this weekend we'll have quite the crop. All of the action is happening on the cherry tomatoes, but the normal tomatoes have surprised me with their rate of progress; I expect they'll take longer to ripen, but will still be ready in the next few weeks. For seeds planted late in the year, to bear fruit in mid to late August is impressive - the effort has been worth it. From humble beginnings. Even more exciting news is that we should soon have some guest postings on this blog from some tomato growers with a little more experience than me. I'll keep you posted.